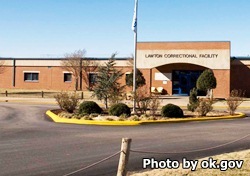 Lawton Correctional Facility is a private prison ran by GEO Group Inc., under a contract with the Oklahoma Department of Corrections. It houses 2,526 medium custody adult male inmates. Offenders housed here can take adult basic education courses, and earn a GED during their incarceration. Additional programs offer inmates substance abuse treatment and life skills courses. Lawton Correctional Facility offers vocational training in culinary arts, computers, cabinetry and carpentry. Inmates can attend various religious worship services and receive counseling through the Chaplain's office. Visitation for general population inmates occurs on Saturdays, Sundays and state holidays from 9am-4pm. Protective custody inmates have visits on Mondays and the day after state holidays from 10am-4pm.